“In my experience, no matter where I ride in the area, it has been impossible to climb above the 1700 foot barrier save for Larch Mountain. I have countless times crested a climb, only to see 1650, 1630, 1680 on my GPS. Was this a design of the road engineers or a natural phenomenon of the local mountains? Either way, it’s been infuriating for me. So you can imagine my delight when I crested George Rd on the Boring? Hardly ride and saw 1845 ft proudly displayed on my GPS. This is the 2nd highest point of this series. Boring was named for W.H. Boring, an early resident of the area. Locals have embraced the name and have a town sign reading, “Boring, the most exciting place to live”. I’ll leave that debate up to you, but I can attest that the riding in the area is nothing short of outstanding. Even getting there is incredible with roads such as Butler and Sunshine Valley. 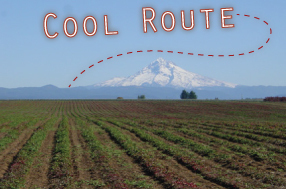 This route comes to us courtesy of Rubber to the Road, the longstanding resource for interesting rides.